As the winter nights draw closer and the dark days come rolling in, on top of the crazy busyness that feeling of accomplishment I have knowing when I head out to work that dinner is bubbling away at home. It always feels a touch "lazy" and "cheating" too!! The usual hit list in the slow cooker is stew or pulled pork. Both are winners and easy to throw together in the morning while battling the normal hustle and bustle the mornings bring. I prefer recipes which are dump and go - I have never browned my meat before cooking and I don't spend ages prepping. I just like the simple approach. I have recently been buying the soup mixes of vegetables from the supermarket - like the butternut squash ones, the veg is small, already seasoned and makes a perfect base for adding the meat too. Anything which makes my morning quicker when getting things ready i'll take. In a bid to try out something more exciting I took to google and pinterest for some ideas to liven up my crock pot game - and these yummy 6 peaked my interest- all adding to the must try soon list. I love the look and sound of the beef curry - I love Indian food and spices and this one sounds particularly yummy. The apple glazed ribs, is an interesting combination of flavours - (personally I am lover of fruit and meat combinations) and ribs cooked slowly is perfect match. A firm fave on ribs here is to get all the meat off the bones before serving and pile on top of fluffy rice. I recently tried a whole chicken in the slow cooker, and was very impressed - but i'm yet to try chicken breast. The hubby is not a fan of this cut of bird as he finds it too dry - therefore by cooking in the crock pot it should retain its juiciness. We prefer the skinless boneless chicken thighs, these have such a lovely flavour. 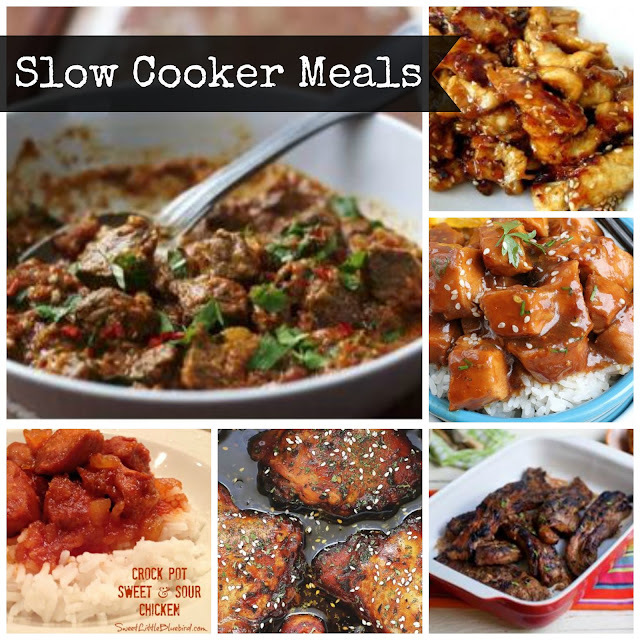 Do you have any favorite dishes you like to use your slow cooker for? Any tips and hints - i'd love to know. I spend far too long browsing pinterest for ideas - any boards I should be following?